As I mentioned in The Dude’s Guide to Surviving Your First Pregnancy, I suggest that expectant parents-to-be see a lot of movies in theaters before their little bundle of diaper-destruction arrives. Mrs. Dude and I were regular theater-goers throughout our relationship until our Little Dude was born. Since then, I think we’ve gone 3 times in 30 months, or about as often as Lindsay Lohan gets arrested. We had a scheduled C-Section, thanks to a large breech baby with a short umbilical cord, so we knew when he’d arrive. During our last weekend of freedom, we went to see “Where The Wild Things Are”, the film adaptation of Maurice Sendak’s classic storybook. Though the movie was quite picturesque, what stood out most to me was how they managed to turn a book containing a total of 10 sentences into a movie 104 minutes long. Also notable, it featured larger-than-life animatronic monsters, one of which sounded exactly like Tony Soprano. "Max, let's grab some Gabagool & head to the Bing"
But Sendak’s tale of young Max and his quest to find his place in the world resonated with me. I’d read the book countless times as a child, but none in the last 30 or so years. It wasn’t until recently that I realized how much I identified with Max. Like him, I left the familiar place I was raised (Ohio) where I often wore unique non-traditional attire (tie-dye shirts) and moved to a far-off land filled with Wild Things (Los Angeles). When I arrived in my new distant land, many things didn’t turn out as I expected. 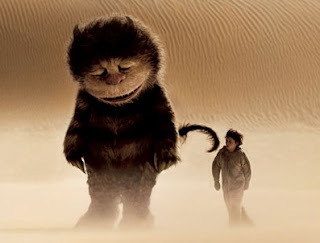 Like Max, I sought to become king of the wild things. And even though that hasn’t happened yet, like Max my journey continues. After more than a dozen years I’ve battled my share of monsters, attended numerous Wild Rumpuses and I’m still here to tell the tale. Now as I raise my Little Dude, I look forward to the day that he gets to hear Sendak’s classic for the first time. And I hope that he is not afraid to express his creativity and individuality, like Max, for better or worse. 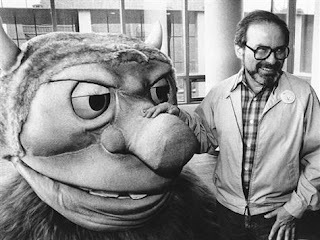 Maurice Sendak died yesterday at the age of 83. May his stories continue to inspire little Wild Things for generations to come. Maurice Sendak (on the right) and a friend. very nice commentary on his passing. I do believe it is time my own kids heard the tale. Thanks, I appreciate it. Let me know how they like it. That book always sort of freaked me out, I don't know why. Did you like the movie? It was showing on the bus on our fieldtrip yesterday and the beginning was very odd. Anna, it definitely has a freaky component to it, but not nearly as bad as the movie. That was very creepy, IMO. Other than the experience, I wouldn't say that I "liked" it. Let me know if you check it out. Thanks for visiting me at Chubby Chatterbox. I appreciate you taking time to leave a comment. I've just found your blog and I think it's great. You have a great sense of humor and I think you're a fine writer. 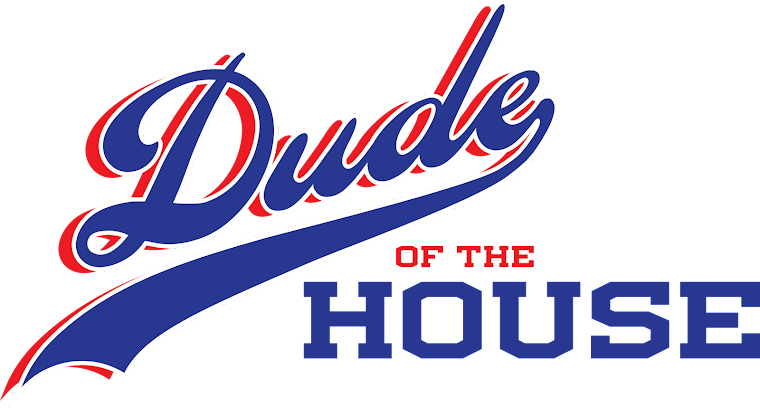 Besides, it's refreshing to find blogs written by Dudes. I hope you'll visit me again at Chubby Chatterbox. If you do, take a moment to press the Join button and I'll return the favor. Have a great day. "The night Max wore his wolf suit" is a phrase that fills me with so many emotions. Respect because I think it's a great opening but also excitement and nostalgia for the story that is to come, that I have read 1001 times to my older son, that I read 1001 times as a child and that I will read 1001 times to my youngest. Since my son is younger, I have a few of those first lines too. A personal favorite is: "In the light of the moon, a little egg lay on a leaf..."
It IS an underrated part of parenthood that we get to re-experience these kinds of stories but with the intellect of an adult. I'm hoping my kids eventually get into Judy Blume so I can go through all of those. Though I suppose there are newer and more popular authors now for that particular reading level. Thanks, Nina. Just because there is newer stuff, doesn't mean it is better than the classics. Let them start with Judy and go from there. Both my boys (ages 16 and 12)LOVED this book!!! I have fond memories of reading this story to them, and this is honestly one of the few books that has never made it into the yard sale pile. 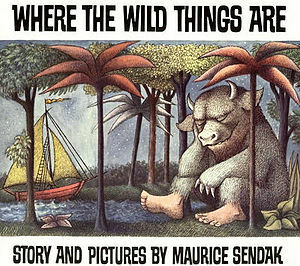 It's a classic and Sendak's legacy will live on for future generations to enjoy.